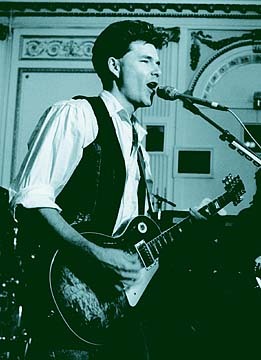 Stuart Adamson, performing in London in September 1988. After the state medical examiner identified the body of a man who was found dead in a Honolulu hotel, police said no one involved in the case recognized the name as belonging to anyone famous. But internationally, word that the man was Stuart Adamson, former lead singer of the 1980s Scottish rock band Big Country, caused quite a stir. By 6:30 a.m. yesterday -- the morning after Adamson was found after an apparent suicide -- Honolulu police Lt. Clifford Takesono said he had received plenty of calls asking about the dead man. Takesono, who said neither he nor anyone else in the case had heard of Adamson, referred calls to the medical examiner. "(The calls) started early (yesterday) morning," said Jimmy Annino, an investigator with the examiner's office. "The last one was from England." Annino had little problem identifying the body as that of William Stuart Adamson, 43, of Nashville, Tenn. The room was listed in his name, and Nashville police faxed Adamson's fingerprints for verification, he said. His body was found Sunday at the Plaza Hotel near Honolulu Airport. A day earlier, a maid had checked on him but thought he was sleeping, police said. On Sunday she found him in the same position and notified hotel managers, who contacted authorities, Honolulu Police Lt. Bill Kato said. Annino determined that Adamson died of asphyxia due to hanging, and Honolulu police said they believe Adamson killed himself. Adamson and Big Country gained popularity in the United States in the 1980s with hits that included "In a Big Country" and "Fields of Fire" from their 1983 album "The Crossing." The group was nominated for two Grammys -- best new artist and best song -- in 1984. The band's popularity waned after the 1980s, and the members split up last year. Adamson continued to draw attention off stage, after he disappeared for two months in 1999 and again last month. His most recent disappearance prompted his estranged wife to file a missing-person report in Nashville. His manager also hired a private detective, and two fans from Florida even volunteered to join the search, according to reports. Police said he checked into the Plaza Hotel on Dec. 4. Police were at a loss to explain how word of Adamson's death spread, but journalists from England and Scotland continue to call Honolulu police, the medical examiner, the hotel and anybody else who might have any more information on Adamson's death.